Work permit for citizens of Ukraine is issued according to the simplified procedure. It is made by the authority of the Federal migration service (FMS) of the region where you plan to work. You should know that the resolution of the specified region of work. In other regions, the activity would be considered illegal. If a citizen of Ukraine will conduct labour activity in several regions, issued the work permit on the territory of Russia. Apply for a work permit as a citizen of Ukraine yourself, as often citizens from the CIS countries arrive in the Russian Federation, hoping to get a job without having an invitation from a company or organization. In the latter case, when a citizen of Ukraine come to Russia to work in a certain organization, then registration may be entertained by the employer. After receiving permission, the employee can be credited to the state employer. When the employer takes the staff of a Ukrainian citizen with a work permit, he shall notify territorial FMS on the conclusion of an employment contract with a foreign specialist. This procedure is carried out in the case of termination of labor contract with a citizen of Ukraine. Submit the documents to the territorial body of the FMS. 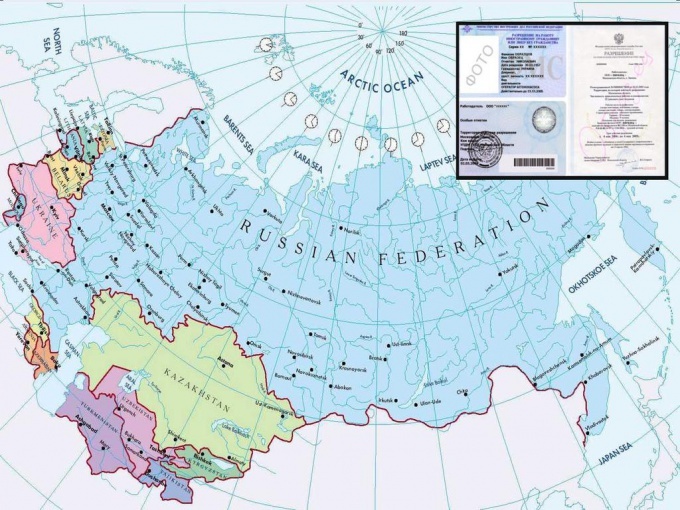 The list of documents when applying for a permit to work is defined by the legislation of Russia, namely: photocopy of all pages of your passport, notarised translation if the records are not made in the Russian language. The passport must be valid and its validity period must end no earlier than six months after the termination of the work permit. This grant is available to citizens of Ukraine who are 18 years of age who had not been deported and has no criminal and administrative offences. Also give the FMS a copy of the migration card, copy of notification of arrival, two photographs, medical certificate, which is issued according to the results of research on HIV and infectious diseases. A citizen of Ukraine may submit a medical certificate within one month of receipt of the work permit. In addition, complete the personal statement and attach documents confirming payment of the registration fee. If registration of the work permit the employer is engaged in, he must submit to the territorial body of the Federal migration service: a statement from myself, a list of citizens, which intends to employ and the letter of guarantee. Stand on the migratory account for a period of three months. This should be done within three days after arrival. Will receive a migration card. Migration registration registration occurs within one or two days. Then get the work permit, which is a plastic card. It gives the territorial authority of FMS and legalizes the employment relationship of a foreign citizen on the territory of Russia. After that, stand up for migration registration for the period of validity of the work permit. It should be done in territorial body of the FMS at the place of the office of the employer. After that, the citizen of Ukraine will have to have a passport, work permit, migration card, a valid notice of registration with the migration Department.